Gold prices were popping Monday boosted by a weaker U.S. dollar and strong physical buying. NEW YORK ( TheStreet ) -- Gold prices popped Monday, boosted by a weaker U.S. dollar and strong physical buying. Gold for December delivery added $25.10 to settle at $1,710.80 an ounce at the Comex division of the New York Mercantile Exchange. The gold price has traded as high as $1,722.40 and as low as $1,684 an ounce while the spot price was up $30, according to Kitco's gold index. Silver prices were rising $1.13 at $32.14 an ounce while the U.S. dollar index was down 0.57% at $79.16. Gold prices rallied as the U.S. dollar weakened against the euro on hopes that a stronger fiscal union between the 17 nations on the currency would help stem the debt crisis. Reportedly eurozone nations led by German Chancellor Merkel and French President Sarkozy are in talks to create more fiscal unity among those countries on the euro -- that is the austerity measures already agreed to would be enforced by the eurozone. Countries would, in essence, give up some sovereignty to save the euro. The hope is that the European Central Bank will then feel more confident about becoming the lender of last resort by buying more sovereign bonds for an extended period of time -- something the central bank was reluctant to do because it thought struggling countries would have less impetus to implement austerity measures. The ECB has been providing short term lending to countries like Greece, Italy and Spain but has done little to lower longer term borrowing costs as private investors shy away from Europe without the ECB's extended support. There were also rumors that Italy would tap the International Monetary Fund for aid. Although later denied by the European Commission, the news helped to support the euro, weigh on the dollar and help gold. Further cheering the gold market was strong physical buying. The SPDR Gold Shares ( GLD - Get Report) now holds almost 1,300 tons as investors ramped up gold buying on last week's selloff. With stocks mounting a big rally, traders will also have less need to liquidate gold. Barclays wrote in a recent note that Exchange Traded Products grew more than 7 tons last week taking total metal to a fresh record at 2,273.5 tons. "We are bullish and look to buy against the $1,600 area. A break above resistance near $1,736 would confirm our view and open our targets near $1,803 and then the $1,840 area. In the most recent commitment of traders report for the week ended November 15th, the latest report was delayed due to the U.S. holiday, investors added 13,000 total long contracts and 17,000 short contracts, which means part of gold's recent rally could be chalked up to short covering. "It's a little bit of a trifecta," says Oliver Pursche, co-portfolio manager of the GMG Defensive Beta Fund. "Great retail U.S. news, you've got some positive momentum out of Europe, to a certain extent there is a little bit of short covering, and the fourth piece is China." Pursche thinks that China is getting ready to slowly turn around its monetary policy. "I think that if you listen to what the finance ministers are saying they are all talking about the fact that they have achieved the desired slowdown in the housing market." Pursche thinks that with housing prices down 30% in some areas, with more pressure on the yuan to rise in value along with a possible recession in Europe, China will be forced to pump more money into the system. "Investor demand is unlikely to drive prices significantly higher in the short term," says Pursche. "What will drive prices higher are fears of inflation ... if you see the ECB print money, the Federal Reserve ease, China change monetary policy that would all be supportive of $2,000 gold prices." Bloomberg reported today that 16 out of the 21 primary dealers that trade U.S. government securities with the Fed expect the central bank to buy more mortgage backed securities -- launching a third round of quantitative easing. From 2008 until June -- during which the Fed launched two QE programs -- gold prices rose 106%, which means prices could hit $3,500 using the same metrics. Randgold Resources ( GOLD - Get Report) will be in the hot seat today, down 7% after lowering 2011 gold production guidance for the second time this year. 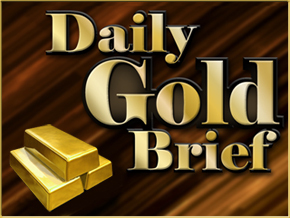 The West African gold miner is now expecting to produce between 690,000-700,000 ounces versus 760,000 ounces on the high end. The miner had to lower guidance from 790,000 ounces before due to unusual wet weather in the Ivory Coast and that factor was primary in the additional revision. But this time there were other problems: a temporary work stoppage in late November due to union negotiation; a longer than expected transition from diesel to the national power grid - although this will be a significant cost saver for the company long-term; a failure of its barring gear in its number one mill on Friday which caused its number two mill to also be shut down. The number two mill should be started on Tuesday but it could take 10 days for the number one mill to be back on line. In the third quarter, Randgold missed on earnings, revenue and production but investors gave the stock a pass due to its high growth rate -- its profit ballooned 335% compared to a year earlier and production was up 9%. David Christensen, CEO of ASA Gold and Precious Metals ( ASA, who is a believer in Randgold's long term growth strategy, said "the market is taking those who do not perform out to the woodshed, no matter how good they have done in the past. Investors are just itching for reasons to sell or short a name." Christensen thinks the pressure on Randgold will pass. The stock was downgraded to reduce from add at Oriel Securities, but its average price target from all its ratings still represents 36% upside from where the stock closed on Friday. Other gold mining stocks were soaring. Kinross Gold ( KGC - Get Report) was rising 3.61% to $13.20 while Yamana Gold ( GOLD - Get Report) was adding almost 4.58% at $15.30. Gold stocks, Agnico-Eagle ( AEM - Get Report) and Eldorado Gold ( EGO - Get Report) were mixed at $40.87 and $17.05, respectively.